Fully sealed solid rail (six sided) extension eliminates deflection, and delivers the smoothest extension movement available. Top plumb vial is permanently positioned at eye level. 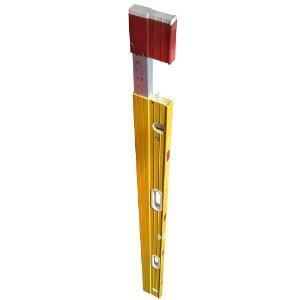 Frame side opposite the stand-offs is a level measuring surface and straight edge. Vials are guaranteed for life never to fog, leak or require adjustment. Certified accuracy in the top read position: 1/32" over 72"
length: 6 - 10 ft.
* Please call us for any questions on our level stabila 10 foot plate rentals in Fort Madison IA, serving Southeastern Iowa and Western Illinois.